I live just east of Phoenix. Today we are at 108 headed to around 120 on Tuesday. Night time temps in the 90's. I'm trying to grow sedums/ succulents in baskets. How often should they be watered and will they make it in the sun as I have very little shade. Comments for How hot is too hot? 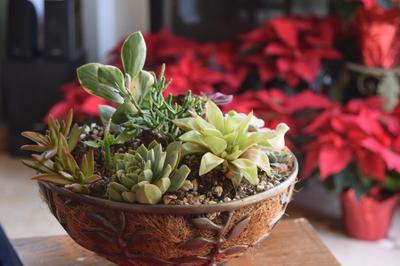 Some succulents do best in bright light, but not so great in unrelenting heat. Some of these include Sedum and Sempervivum. These evolved in areas of high altitude, where they get exposed to intensely bright UV light, but they don't thrive in heat. Some of your succulents may fit this description. Watering them more does not make them more able to withstand heat. Keep close records as you go through the season as to which types of plants will survive and thrive in your conditions. Some may go dormant, to revive later on when the weather isn't so intensely hot. Others may take over and love the conditions you've got. Every home in every area has different climates specific to that exact spot on the globe. Duplicate your successes next year, and learn from the mistakes and poor choices of plants that didn't survive.